. إن منتجع آرتيك سيرفرز بارادايس حريص على توفير الراحة للنزلاء، فلا يوفر الموظفون جهداً في تقديم أفضل الخدمات وضمان حسن الاستقبال. يمكن لضيوف الفندق الاستمتاع بالميزات التالية على أرض الفندق: تسجيل وصول/مغادرة سريع, تخزين الأمتعة, واي فاي في المناطق العامة, موقف سيارات, انتقالات المطار (من أو/و إلى). تعكس غرف الفندق البالغ عددها 110 المنتشرة في 30 طوابق جواً من الدفء والألفة.خدمات عصرية مثل سياسة التدخين - غرف لغير المدخنين متاحة, مكيف هواء, شرفة/ تراس, تليفون, شبكة اتصال محلية بالإنترنت موجودة في بعض الغرف المختارة. يمكنك طلب اللائحة الكاملة للخدمات في الفندق ومن بينها جاكوزي, مركز للياقة البدنية, ساونا, مسار جولف - ضمن 3 كم, مسبح خارجي. مهما كانت أسبابك لزيارة المدينة، فإن منتجع آرتيك سيرفرز بارادايس هو الخيار الأفضل لإقامة مثيرة وممتعة. العقار يطلب مبلغ تأمين مسترجع بقيمة 300 AUD عند تسجيل الدخول. We have stayed here for 4 years in a row now and would happily recommend it to anyone. The staff are very friendly and accommodating and the facilities are great. The theater room is great for tired kids at the end of a busy day in the sun. The pool is large enough that it doesn't get too crowded. The views are amazing from the beach and city view rooms. We needed to bring two cars this year as my husband needed to head off for work purposes and there was no issue with providing an additional car parking space. This is a location that you could return to year after year. We stayed in 2 bedrooms apartment on 7th floor. The apartment is clean and spacing. From the balcony, we can see the beach and city. 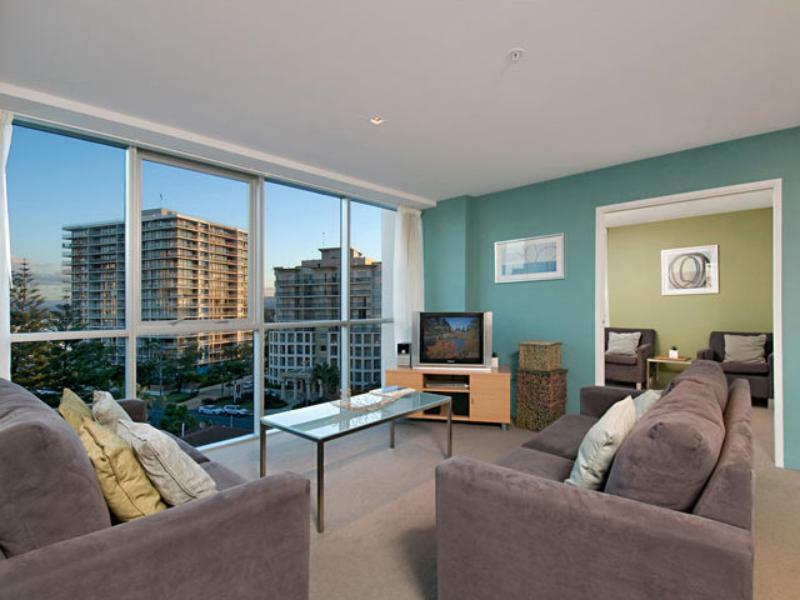 The location is within 10 minutes walk to main centre and a few minutes to the beach. Excellent. To us, the location was perfect - a short walk to the beach and a short distance away from the more crowded main Surfer's Paradise. Was given a free upgrade from a 1-bedroom to a 2-bedroom apartment. The apartment was spacious, clean and looked new, with a fully equipped kitchen and laundry facilities. The bed was comfortable. The staff were cheerful, polite, knowlegable & helpful. Checked in after reception hours and didn't seem to catch where the night safes were located - some signs at the reception counter would have been helpful. The toilets are brightly lit, so if you have a habit of going in the wee hours, the brightness is jarring. The gym is basic - more for cardio. No bench for free weights, resistance training by machine. It is an apartment hotel and we were very happy to stay there. It is very nice coz you can do your laundry in the apartment. I will give 9.5/10. For the -0.5 is because the reception close at 4 pm but check in time is 2 pm. 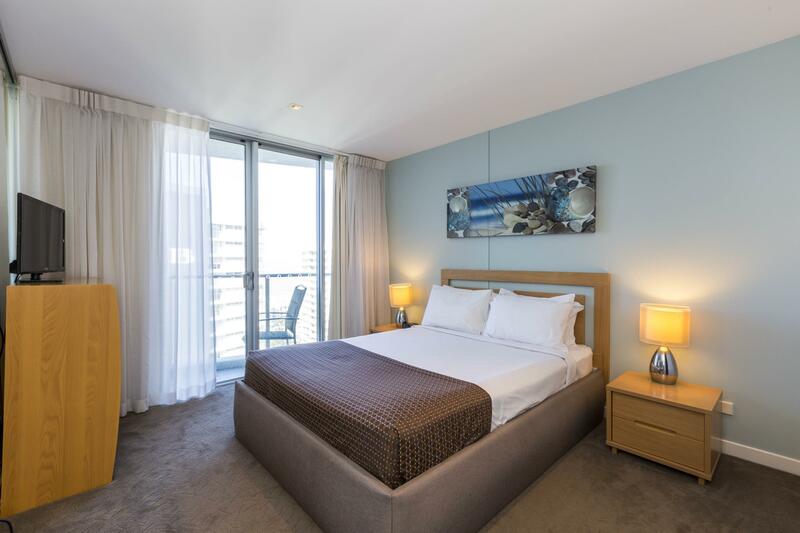 The resort apartment is located right opposite the quieter side of surfers paradise but within walking distance. There is a tram nearby but we didn't took it as we drove around. The resort provided free parking with a very secured garage parking and best part is direct lift access from carpark to your room (there is no need to change lifts at lobby). A $200 is required for deposit during check-in. As we are only there for 4 days 3 nights, housekeeping was not available thus we are required to do our own housekeeping. We didn't have any issues with that as we brought along our own laundry detergent along with us for our trip. The kitchen is equipped with dryer, washer, dishwasher, oven and a stove! We had two balconies in our room and both balconies had really fantastic views, my daughters were in awe! The room itself is really spacious for young children to run around. Would definitely return to Artique! not all staff are as friendly and helpful... went to the wrong area to retrieve keys as it was a late check in. Two (a lady and a man) of the staff happen to see me while they are making their way out. The lady pretended that she didn't see me but the man was helpful to direct me to the correct place. Came to QLD from Melbourne for a 4 night stay and did not want to be directly in the centre of the city to avoid the chaos! When we arrived it was a quick and easy process to get checked in, We had free parking for our rental car, it was a very convenient and easy process to get in and out. To our surprise the room was much bigger than expected, we did not expect to have a balcony and we got 2! 1 view was of the beautiful surfers beach and on the other side we had a beautiful view of the lake and the more greener area of surfers. We figured out how to get around very easily without our GPS from this location also. The room we had included a big kitchen, dining area, lounge area, stereo, TV, cable tv (austar), bathroom including bath, hair dryer was also included and entire place was furnished out with kitchen utensils, complimentary tea and coffee, sachets of washing liquid for clothes washing as their was a laundry area hidden inside a cupboard with washing machine, dryer, basket and some other bits and pieces. Master bedroom had some great space for clothes and bags, a beautiful view of the city from our room, had a little bit of tram noise but it was not an issue for us. we had heating and aircon system which came in handy when cold at night, if you plan on cooking, a stove and oven is also available, followed by other equipment such as toaster and microwave. 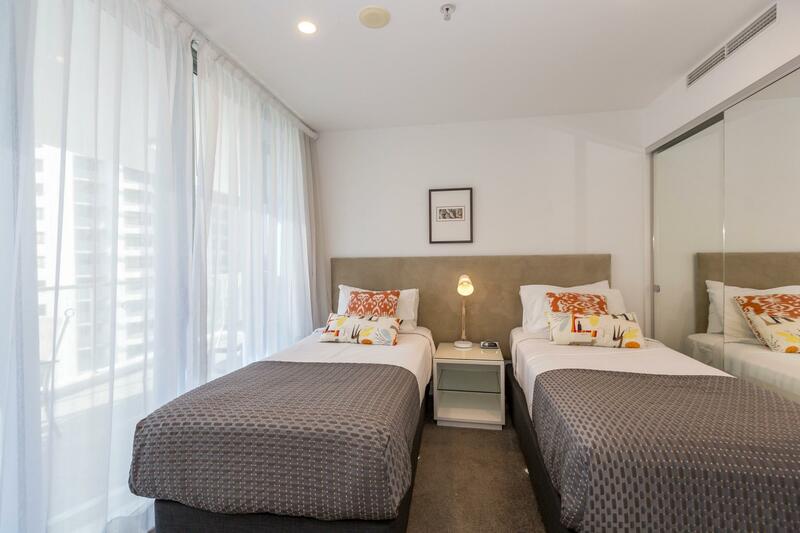 If you're looking for a comfortable, enjoyable and relaxing stay where you wont have anything to worry about other than making the most of your time this is definitely the place to stay, I will be revisiting QLD soon, I will be coming back here. Thank you for the wonderful stay it was amazing and the ladies at reception were so kind and helpful. The location is nice, 10 mins walk to the mall. And beach just 2 mins walk. Staffs are friendly and helpful. It is a large apartment with two room but it is smelly. Every day I open all the windows to try to get rid of the smell. And I stay there for 4 nights, the smell still there when I left. Every night I went to bed, my skin will start to itchy and red dot start to appear. And the next morning when I get out of bed and go out to explore the city I will be just fine. But when I am back to sleep. The itchy come back every night. So I think the room is not clean enough. 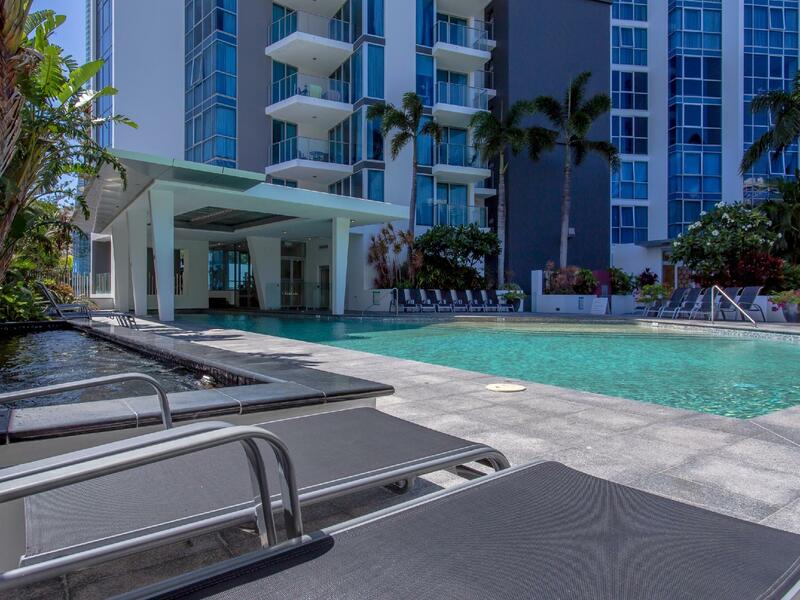 Perfect location, fantastic pools, great if you have kids! Lovely apartment with amazing views!